In previously unpublished written testimony before the Senate Armed Services Committee, Mattis wrote that “climate change can be a driver of instability and the Department of Defense must pay attention to potential adverse impacts generated by this phenomenon,” according to Pro Publica, which published parts of his remarks. Mattis was the first cabinet member of the new Trump Administration to be confirmed and his answers to the senators’ questions were apparently delivered after his vote. Mattis is not alone in his assessment. Every sitting secretary of defense since Robert Gates, first appointed in 2006 by George W. Bush, has noted that climate change is a significant and appropriate concern for the department. Leon Panetta, in 2012, named climate change, and environmental threats generally, among a number of new threats to national security in the 21st century. He cited Teddy Roosevelt (“in utilizing and conserving the natural resources of the Nation, the one characteristic more essential than any other is foresight”) and said taking climate change seriously was part of the department’s focus on the long-term view. Mattis hinted at a similar line of thought in his testimony almost a decade later. Such acknowledgements by the military and intelligence communities about the seriousness of climate change are not rare. Nor are they necessarily intended to suggest climate change should be the primary focus of the U.S. security apparatus or anything about a hierarchy of threats, vis-à-vis terrorism, nuclear weapons, or any other complex danger faced by the United States today. But such consistent concern across multiple administrations and leadership styles demonstrates that climate change has been a significant factor in U.S. national security thinking for some time. Sources: Foreign Policy, Pro Publica, U.S. Department of Defense. 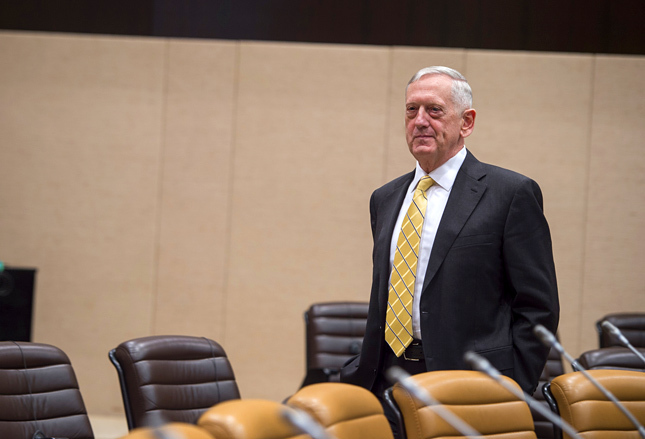 Photo Credit: Secretary of Defense James Mattis at NATO Headquarters, Belgium, February 2017, courtesy of Tech. Sgt. Brigitte N. Brantley/U.S. Air Force. Topics: Arctic, climate change, conflict, Congress, environment, environmental security, featured, foreign policy, funding, media, military, natural resources, security, State, U.S.